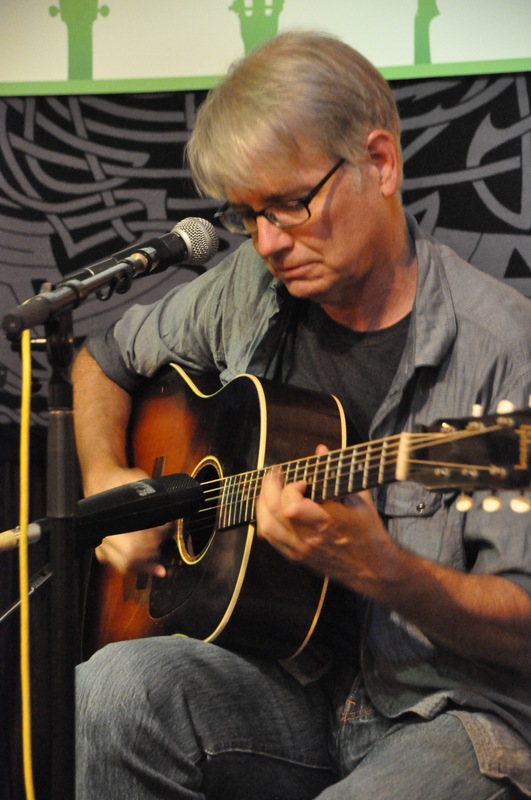 Scott Nygaard is one of the most inventive and original guitarists in the bluegrass/acoustic music scene. His solos, a seamless amalgam of bluegrass, folk, and jazz influences, shift easily from breathtaking virtuosity to soulful melodic musings and his accompaniment is always intriguing, supportive, and propulsive. Initially influenced by Doc Watson, Clarence White, and Django Reinhardt and Riley Puckett, Scott spentmany years wandering the sea of American music that includes bluegrass, jazz, Cajun, old-time, western swing and rock and roll, and has since expanded his musical world to include traditional Swedish and Irish music. Scott has released two solo albums on Rounder Records, the second of which, Dreamer’s Waltz, an intriguing mix of original and traditional tunes, was nominated for an Indie award by the Association for Independent Music. He has released and produced/co-produced albums with the groups Scott Nygaard and Crow Molly, Roger Tallroth and Scott Nygaard, the Websters and Scott Nygaard, and the Harmonic Tone Revealers in the last decade. Former editor of Acoustic Guitar magazine, Scott has written hundreds of articles on music, musicians, guitars, and guitarists for Acoustic Guitar, Strings, Play Guitar!, and Guitar World Acoustic; authored two instruction books, Bluegrass Guitar Essentials and Fiddle Tunes and Folk Songs for Beginning Guitar (both String Letter Publishing/Hal Leonard); produced an instructional video, Bluegrass Lead Guitar (Stefan Grossman’s Guitar Workshop), and taught at music workshops from Fairbanks to Finland. He recently co-founded Peghead Nation, an online roots music instruction site, with subscription based courses in mandolin, fiddle, banjo, dobro, guitar, and ukulele. In addition to being Peghead Nation’s editor and education guru, Scott also teaches four courses: Flatpicking Guitar, Intermediate Flatpicking Guitar, Roots and Bluegrass Rhythm Guitar, and Weekly Guitar Workout. Hi Mike, Glad you’re enjoying the video. That’s a good idea. Maybe I’ll propose it to one of the instructional video moguls. I am in the midst (texan for middle ) of your Bluegrass Lead Guitar DVD. I really like your aproach to the lead. I have been playing the banjo for many years, and seriously studying the guitar for the past several. I am really interested in material that moves me beyond the first few positions. After going through the songs in the dvd, I feel like I am starting to understand a little more of what is going on. Perhaps someday you would consider this type of material. It is lacking in the comumity.